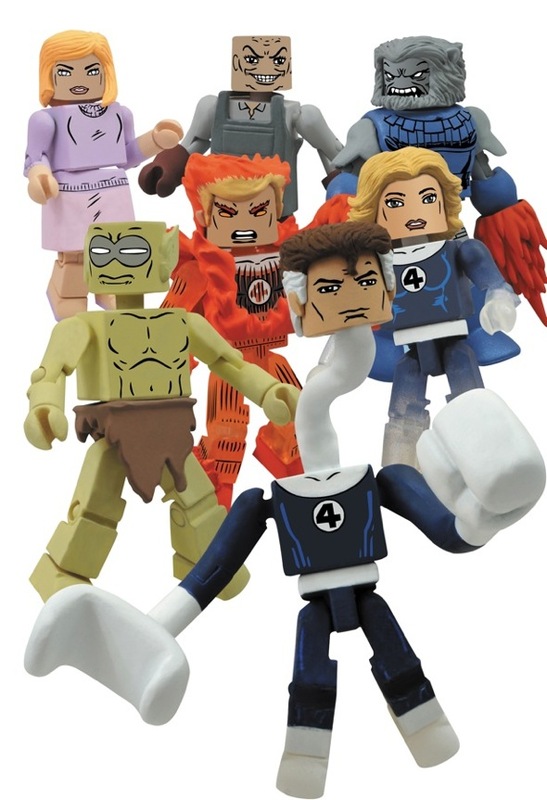 Diamond is celebrating the return of the Human Torch to the pages of Fantastic Four with an all new, all Fantastic, series of Minimates. Series staples abound in the new set including three members of the team's classic roster, a few famous old foes, and an ally in what *I think* might be the first Alicia Masters figure- the girlfriend of the ever-lovin' blue-eyed Thing! All in all, there'll be four two-packs, which is kind of fitting given the subject. Mr. Fantastic and the Puppet MasterTeam leader Reed Richards comes with an classic FF foe, the conveniently named Phillip Masters. Wearing his John Byrne-designed uniform, Mr. Fantastic will sport a new stretching fist and a grabbing arm. Meanwhile, Masters will come with his distinctive apron... as well as miniscule Minimate puppets that he can manipulate, to control the actions of his foes! "Flame On" Human Torch and BlastaarJohnny Storm, the hot-headed member of the Fantastic Four, has been captured in mid-combustion, and comes with a new flame-swirl display base. Once he flames on, he'll be ready to go into battle with one of the Negative Zone's most lethal residents: Blastaar, the Living Bomb-Burst! Blastaar has the ability to create concussive blasts from his hands, and will sport new blasting hand covers to simulate his power. The Invisible Woman and a MoloidThe most powerful member of the Fantastic Four, according to some, Susan Richards includes opaque and partially translucent limbs to simulate her invisibility, a new clear display base to simulate her force field powers, and an alternate hairpiece to show off her ever-changing hairstyles! She'll need everything she's got to hold off an army of Moloids, dispatched by the Mole Man to conquer the surface world -- unless these are the Moloids she makes sandwiches for as part of the Future Foundation. Alicia Masters and a MoloidBuying multiple Moloids need not leave you with an arsenal of Invisible Women -- the variant two-pack in this wave pairs a Moloid with Alicia Masters, the blind sculptress! She loved Ben Grimm for his inner nobility and hated her step-father the Puppet Master for manipulating the man she loved, and she even comes with a sculpture of her own -- a bust of the Thing! The new Fantastic Four assortment will only be available at comic shops- so make sure you pre-order a set for yourself today!